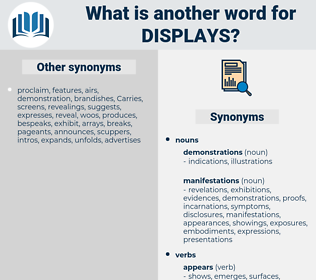 What is another word for displays? specifies, introduces, indicators, submits, releases, offerings, reviews, deals. professional, airs, suggests, proposes, deals, review, ministry, fits, viewing. demonstrates, instructions, installations, illustrations, representations, indications, graphics, slideshows, spectacles, Galleries, details, paintings, celebrations, manifestations, signals, Pleadings, contains, 'expositions, WINDOWS, represents, occasions, proclamations, visualizations, encompasses, Attitudes, paints, specifies, includes, declarations, slides, devices, introductions, showcases, panellists, boards, stalls, images, performances, wallcharts, placards, introduces, identifies, visuals, delivers, examples, appliances, affiches, tradeshows, sampled, supplies, designates, Screenshots, demonstrators, tell-tales, explanations, Assemblies, proposals, signifies, highlights, viewfinders, papers, Rallies, included, markings, discusses, points, uprisings, profiles, museums, protests, involves, fliers, fairs, Achievements, directions, productions, statements, shields, indicators, readings, fireworks, panes, electronic, Stations, particulars, words, plates, samples, briefers, Facilities, renditions, billboards, acts, yields, registers, incidents, flags, pictures, eyewitnesses, interventions, submits, steps, storefronts, marches, announcements, arrangements, scopes, Gestures, dashboards, promotions, Artifacts, instructors, quotations, kiosks, speakers, computers, observances, submissions, articles, releases, offerings, walls, stands, flyers, broadcasts, barriers, holds, reports, flowers, exhibitors, brings, Referrals, covered, reactions, features, drawings, tables, denotes, holders, speeches, views, tells, Schedules, materials, performers, montages, trainers, nominations, Phenomena, refers, tabulations, EXPOS, newsstands, Watches, Hearings, briefs, witnesses, see, cases, remarks, Cameras, briefings, spots, notices, Lectures, benchmarks, Bears, fronts, mountings, posts, format, FORMATS, advances, racks, beacons, launches, bidders, fixtures, stages, objects, Movements, tenders, schemes, items, gauges, hints, prompts, notes, sets, coaches, sheets, charts, concerts, Outbreaks, theatres, pinpoints, booths, places, Entries, tubes, visors, pans, blocks, Cookies, Demos, states, doors, RIGS, frameworks, controls, amounts, metres, decks, returns, SUBS, mounts, mountains, renters, keeps, scenes, deals, opens. demonstrated, illustrated, Indicated, represented, revealed, reflected, proved, expressed, underscored, found, charts. demonstrating, Exhibiting, appearing, Proving, becoming, review. 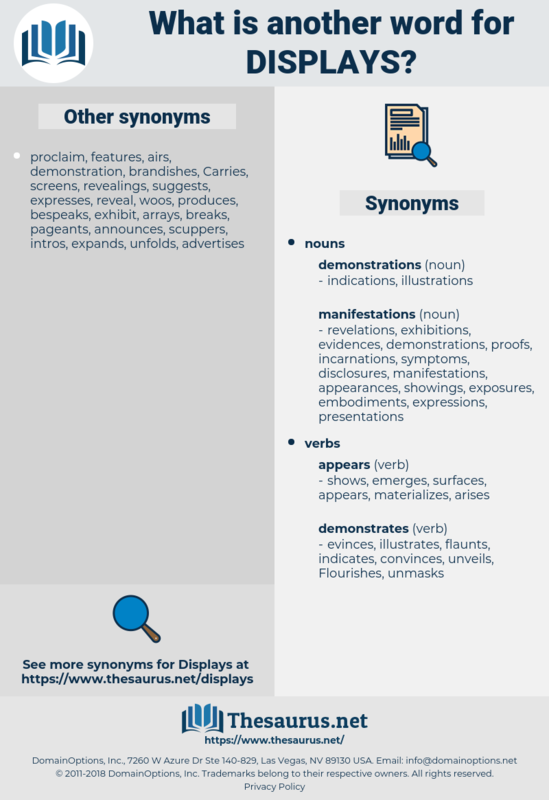 lays, disays, illustrates, Plays, portrays, depicts, testifies, exists, incorporates, discloses, advertises, reproduces, says, replicates, prefers, hangs, files, reveals, demonstrates, Manifests, Addresses, emphasizes, attest, attests, exemplifies, explains, publishes, establishes, advises, summarizes, specified, issues, Campos, stipulates, betrays, adopts, dictates, describes, underlines, implies, reflects, proves, selects, expresses, resembles, unlatches, deploys, boasts, declares, possesses, reiterates, constitutes, articulates, populates, communicates, asserts, fails, operates, corresponds, generates, underscores, examines, consists, embodies, outline, outlines, lacks, develops, instructs, unveils, details, confirms, Leaves, comprises, directs, captures, speaks, suffers, signals, produces, envisions, endangers, repeats, emits, sends, determines, fields, concludes, furnishes, enables, contains, defines, argues, raises, leads, finds, seems, filters, conveys, maintains, mentions, observes, entails, follows, marks, invokes, emerges, recurs, allows, sees, creates, represents, flaunts, Carries, prepares, informs, remains, encompasses, reads, moves, paints, clears, teaches, wears, outputs, specifies, poses, falls, Strikes, includes, renders, reinforces, slides, enjoys, is, lodges, contributes, executes, showcases, combines, With, undertakes, announces, introduces, Focuses, identifies, occurs, relates, PAVES, delivers, mirrors, threatens, seeks, arises, looks, extends, supplies, designates, hosts, becomes, Comes, crosses, covers, signifies, highlights, Has, wishes, discusses, Gives, points, Faces, profiles, breaks, involves, uncovers, takes, happens, resumes, worm, samples, yields, submits, POPS, turns, throws, releases, tries, stands, puts, broadcasts, holds, reports, brings, features, accounts, denotes, views, tells, goes, refers, see, runs, meets, counts, Bears, posts, launches, Does, prompts, notes, sets, pinpoints, places, means, states, amounts, returns, makes, gets, airs, suggests, proposes, prints, deals, exhibitions, opens, viewing, visible. screen, screens, presentation, presentations, exhibition, exhibitions. specimens, expressions, Shelves, screen, screens, presentations, exhibitions. The former displays better taste. Both classes of phenomena, however, are not only displays of force, but also objects of thought. dispel, dishful, decouple, decisively, dissociable, despoil, dishevel, disavowable, decibel, duckbill, decayable, disable, dog flea, disavowal, dishabille, deshabille, disk file, dog hobble, detachable, deducible, discocephali, Dutch people, disciple.